This BIG, Heavy Consolidated - Phoenix Glass PILLOW VASE is 9 ¼" tall, almost 8" wide and 3 deep § there are no chips or cracks, no flakes or nicks. This gorgeous version of the RARE Fish Vase has soft medium blue fish in Hi-Relief on a custard ground § the image of swarming blue fish is striking - all sides and ends are decorated. This is a rare design from Consolidated, seldom seen and, if so, often broken § and rarely in colors. More than just a pretty picture. 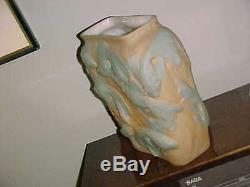 The item "Large PHOENIX CONSOLIDATED PILLOW VASE SWARMING FISH BLUE on CUSTARD" is in sale since Wednesday, February 03, 2016. This item is in the category "Pottery & Glass\Glass\Art Glass\North American\Phoenix/Consolidated". The seller is "artz9" and is located in Camp Hill, Pennsylvania. This item can be shipped to United States, Canada, United Kingdom, China, Mexico, Germany, Japan, Brazil, France, Australia, Russian federation, Denmark, Romania, Slovakia, Bulgaria, Czech republic, Finland, Hungary, Latvia, Lithuania, Malta, Estonia, Greece, Portugal, Cyprus, Slovenia, Sweden, South Korea, Indonesia, Taiwan, South africa, Thailand, Belgium, Hong Kong, Ireland, Netherlands, Poland, Spain, Italy, Austria, Israel, New Zealand, Philippines, Singapore, Switzerland, Norway, Saudi arabia, Ukraine, United arab emirates, Qatar, Kuwait, Bahrain, Croatia, Malaysia, Chile, Colombia, Costa rica, Panama, Trinidad and tobago, Guatemala, Honduras, Jamaica, Antigua and barbuda, Aruba, Belize, Dominica, Grenada, Saint kitts and nevis, Saint lucia, Montserrat, Turks and caicos islands, Barbados, Bangladesh, Bermuda, Brunei darussalam, Bolivia, Ecuador, Egypt, French guiana, Guernsey, Gibraltar, Guadeloupe, Iceland, Jersey, Jordan, Cambodia, Cayman islands, Liechtenstein, Sri lanka, Luxembourg, Monaco, Macao, Martinique, Maldives, Nicaragua, Oman, Peru, Pakistan, Paraguay, Reunion.